Get ready, Gum Ballers, the 13th chapter of the mightiest festival on Dashville soil just hit full steam! Leading the second round of artists announced for the festival is Australia's premier soul funk outfit THE BAMBOOS. Joining the big bush party too are Brit-rock superstars THE CRIBS, who will kickstart their first Australian tour in five years with a visit to Dashville. As with every Gum Ball line-up, the Dashville team goes to great lengths to choose a tasty bill. On our bucket list for many years has been psychedelic garage rockers ROCKET SCIENCE, who will make their Gum Ball debut this year. While team Dashville were representing at a world music conference in New Brunswick, Canada, last year, the discovery was made of an incredible live band called LES HÔTESSES D'HILAIRE. Mashing together fuzzy blues rock and growling French mystique, the Moncton band, led by bearded moo-moo wearing giant Serge Brideau, were promptly invited to come on down and play The Gum Ball. Dashville is super excited that the offer has come to fruition. "You're in for a real treat!" Amongst all the latest exciting additions, you might recognise the words V TRIBE. The 10-piece reggae outfit led by Mini Vaivao and his mighty brothers, dished out the sweet vibes in spades way back in 2013. Excitingly they will be joining us again in 2018! Heading to The Gum Ball is our old mate and arguably one of Australia's greatest singer/songwriter Ben Salter, Melbourne ska rockers The Resignators, Sydney pysch-funk outfit Thunder Fox, singer-songwriter extraordinaire Dave Wells, Adelaide alt-country duo Hana & Jessie-Lee, indie-rock band Letters to Lions, dark rock outlaw Nicholas Connors, the psychedelic pop of Lennie Tranter & The Bagism Revelation and the legendary formidable force of the all star local supergroup Dashville Progress Society. + SCREAMFEEDER + HAT FITZ & CARA + NEW VENUSIANS THE RESIGNATORS + BAGHEAD + V TRIBE + DAVE WELLS LETTERS TO LIONS + WANDERERS + THUNDER FOX + TERRA LIGHTFOOT (CA) + CODA CHROMA + HANA & JESSIE-LEE + NICHOLAS CONNORS + LACHLAN X. MORRIS + DASHVILLE PROGRESS SOCIETY + LENNIE TRANTER & THE BAGISM REVELATION. 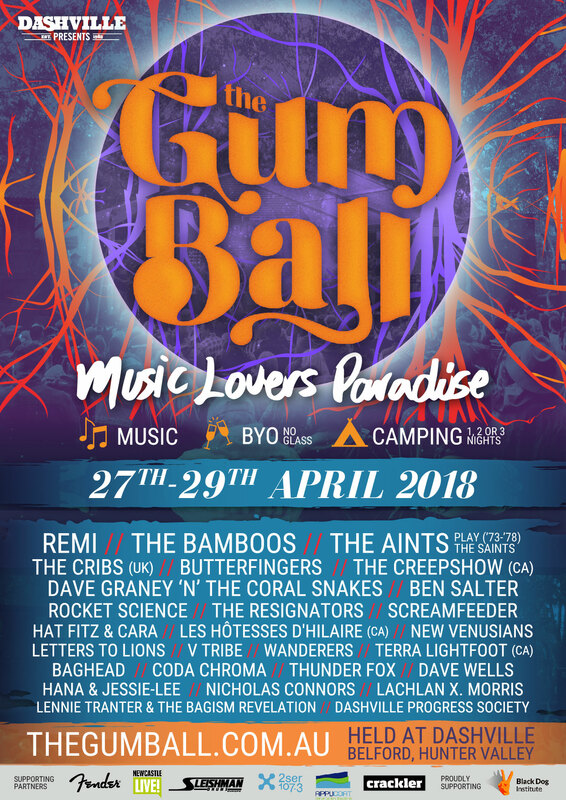 The Gum Ball is a BYO, all age camping festival, that also includes an array of amazing gourmet food and markets, licensed bar precinct, popular late night silent disco, a night time kids crèche, various workshops and activities, morning yoga, pro skater demos and live artworks. Tickets are on sale and selling quickly. Adult, pensioner, teenager, youth and under-6 tickets remain. Full weekend and Saturday only tickets are still available, and an extra night of Sunday artists will be announced soon. Limited tickets remain for the Sunday evening. The Gum Ball is on Friday, April 27 to Sunday, April 29, 2017. Download Hi-Res images for media. Visit this Dropbox link to source hi-res and low-res images for media announcements. Please credit photographers where possible.